How Do You Spell CPS? 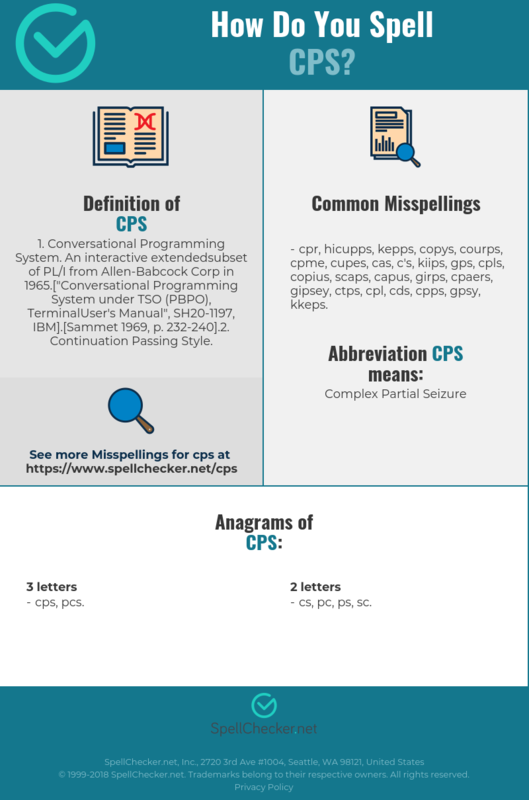 Correct spelling for the English word "cps" is [s_ˌiː_p_ˌiː__ˈɛ_s], [sˌiːpˌiːˈɛs], [sˌiːpˌiːˈɛs]] (IPA phonetic alphabet). 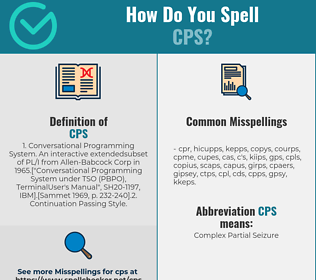 Below is the list of 171 misspellings for the word "cps". 1. Conversational Programming System. An interactive extendedsubset of PL/I from Allen-Babcock Corp in 1965. ["Conversational Programming System under TSO (PBPO), TerminalUser's Manual", SH20-1197, IBM]. [Sammet 1969, p. 232-240].2. Continuation Passing Style.